Bristol is unfortunate enough to be a home to AstraZeneca (killed 398,000 animals in 2011 alone) and AXA (investor in AstraZeneca) as well as Air France (transport animals for vivisection) flying from Bristol Airport. We demonstrate against all of these regularly. We also travel to demos in Oxford against vivisection at the university, and national demonstrations all round the country. 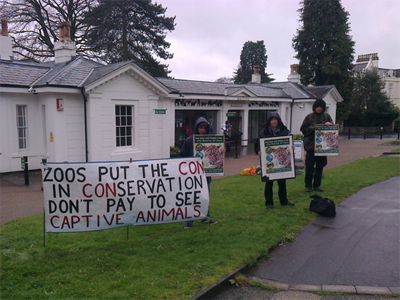 Bristol Zoo, Noah’s Ark Zoo Farm and Bristol Aquariam all hold animals captive for entertainment and, as a result, are all considered demo targets. We also demonstrate against any animal circuses who are brave enough to come close to Bristol. 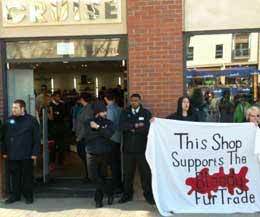 Every time we find a shop selling fur in Bristol we campaign against them until it’s removed. It never takes long. We also hold demos outside leather shops, to ensure people understand we are opposed to all clothing made from skin, and they can’t get away with selling it. The ultimate aim of these demos is to cause these companies to end their involvement in animal exploitation, but the tactics of each can differ. Sometimes we demo with the intention of disrupting business and damaging profits, other times our aim is to expose the company and inform the public. It’s important that we employ a diversity of tactics to achieve our goals and keep space open for dialogue on what tactics are most effective. We can always use more numbers on demos, so get in contact if you want to help, or if you’ve arranged your own demos and want support.